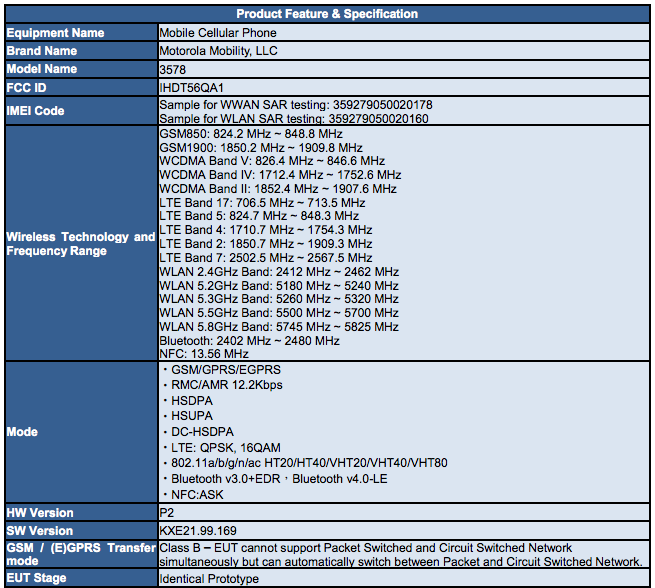 An FCC filing for a device made by Motorola and with AT&T written all over it (in terms of connectivity) has arrived, a device that we can only assume is the next Moto X (or Moto X+1). The device falls under FCC ID IHDT56QA1 and is linked below in case you want to look through the documents yourself. Why do we think this is the new Moto X headed for AT&T? Well, it sports all of AT&T’s bands, from GSM (850/1900) to LTE (2, 4, 5, 7, 17). And that’s almost all that we have to go on, since this filing actually hides other details of the device. The thing is – what other device could it be? Motorola is going to unveil the new Moto X next week in Chicago, so an FCC filing for the phone ahead of time only makes sense. The image above gives us measurements as well, numbers that point to a device that is similarly sized to the Galaxy S5. The FCC measurements indicate that this Motorola phone is 140×72.6mm – the Galaxy S5 is 142×72.5mm. The new Moto X is expected to sport a 5.2-inch display, with much less bezel than the GS5, which would certainly put them around the same size, even with a slightly larger display on the new Moto. Edit: Since many are assuming that the FCC’s measurement of 149mm across the display screen means a 5.9-inch display on the phone, I’ll have to stop you there. Keep in mind that the LG G3 has a 5.5-inch display with minimal bezel, yet it measures 146.3×74.6mm. There is no way that the new Moto X can measure 140×72.6mm, yet have a display that is .4-inches bigger than the LG G3. It’s just not possible. The FCC filing is likely just misrepresenting the situation here a bit by putting “display screen” on the image to indicate that this is the front of the phone. These measurements are for the entire phone, not just the display. We should point out that the FCC label and model number appears to be located on the bottom of the phone, something we can confirm as being true for the new Moto X. Information we have received from sources leads us to believe that the back of the new Moto X will be clean, without FCC markings. Other variants of the device for other carriers have yet to appear. Once those do, we will be sure to pass that info along.